In a recent interview with Gamespot, Telltale's former creative director Kent Mudle and CEO of Skybound Games Ian Howe discussed the resurrection of The Walking Dead: The Final Season. 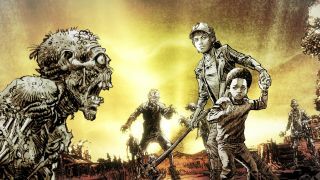 When Telltale's closure was announced in 2018 only the first episode of the four-episode series had been released, and while the second made it out before doors closed the last two were still in early stages of pre-production. Skybound stepped in help out, even though their games division consisted only of five people. "We were less than a year old and we were still definitely in training wheels", Howe explained. Fortunately the work seems to have been relatively painless. "Telltale was literally the lowest maintenance team I've ever worked with," he said, "they literally just came back in and got on with the job." Howe also discussed how important it was to get some of the original staff on board, giving at least temporary employment to over 40 laid-off Telltale employees. They formed a team called Still Not Bitten and even returned to what had been Telltale's office to finish the series. As Howe said, "These guys had been let go without any severance and have been through a tough situation--can we figure something out? Thankfully we were able to put together something pretty quickly, and I will give huge credit to the management of Telltale who went out of their way and did everything they could to make this deal happen as quickly as it could." Mudle discussed how important it was that they were allowed to finish this project, which was clearly close to his heart. "Episode 4 makes me extremely emotional," he said, "honestly. Like a lot of it is tough near the end, in that it's kind of a loving tribute to the people that worked on the game. I still can't even look at it without getting a little misty-eyed. I'm just so proud of the work everybody did. We all came together to make this beautiful thing and to leave that stretching back into all the years that I worked with all of those people. It's the end of an era, and it's sad, but I'm glad we got to at least finish it in style."